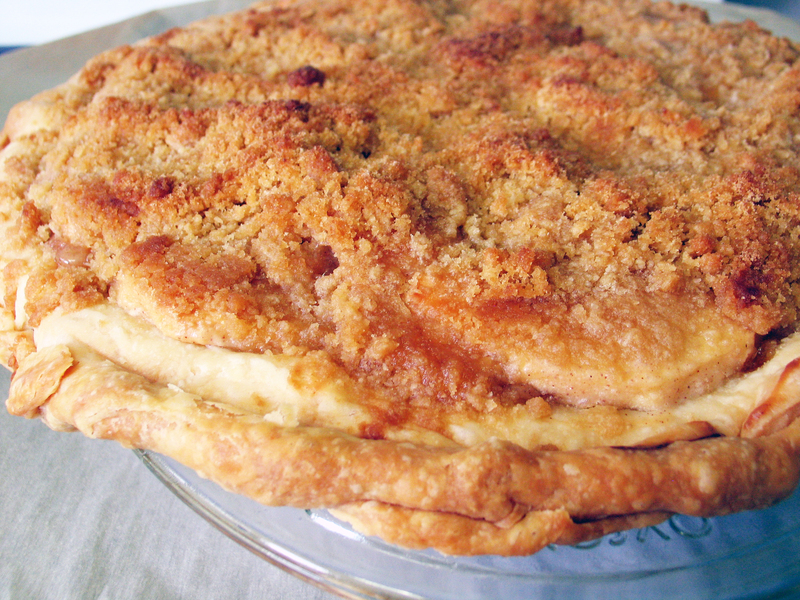 Better known as…sour cream apple pie with a crumb topping. This is from Ma and the original is from an old Shepherd King Church Cookbook – enjoy! Streusel Topping – 2/3 c. EACH flour AND brown sugar whisked together – then use a pastry cutter to cut in 6 T. cold butter until the mixture is well mixed and crumbly. Preheat the oven to 450. In a large bowl, sprinkle the apples with both sugars, cinnamon, nutmeg, salt and lemon juice and mix well. Allow the apples to macerate (sit and get juicy) for a good half hour, then drain the whole mixture through a colander placed over a bowl. 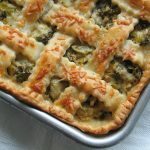 Pour the juices into a small pot or microwave safe bowl, add the butter, bring it to a boil and reduce the juices by at least a third – you can skip the whole macerate and reduce step, but this really does help your pie to stay together. Add the apples from the colander back into a large bowl and mix in the flour, then add in the sour cream and stir until all is well combined. Spoon the mixture into your prepared pie shell, pour the juice and butter reduction evenly over top and then liberally and evenly sprinkle on the streusel topping – you’ll feel like it’s a lot, but this is a good thing. Bake at 450 for 10 minutes, then add your crust protecting ring and bake at 350 for 45 to 50 minutes until the crust that you can see through the pie plate is a golden brown and the top is as delightful looking as you’d like. Allow the pie to cool to room temperature to allow for nicer looking slices.